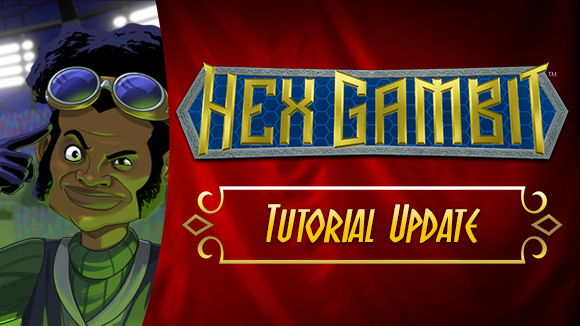 After a lot of hard work, we’re proud to release the tutorial update for Hex Gambit! Now you can learn the basics without reading walls of text in PDFs. This latest update puts us in the home stretch of development. We’ll be looking at the game from every angle in the coming weeks, polishing up the experience, implementing missing visual FX, and getting everything ready for launch on Steam. We’re almost there! Improvements to AI behavior when they have 0 AP but still have actions left. 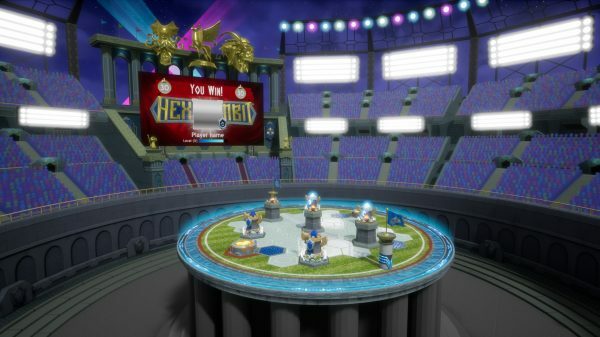 Known issue: Adam is revamping the stadium for online play, so some of the arena visuals are weird-looking this update due to the transition. I need to get back in the groove of updating this feed. It’s so tempting to just lock ourselves in a bunker and work! We’ve been busy assembling an interactive tutorial for Hex Gambit and prepping for the next big thing we’ve never done before: localization! We plan to have the game translated into Spanish, French, Russian, and German to help grow our footprint on launch day. The target keeps moving around for when that might be, but the Steam release will come first, and we’re aiming to be on the Nintendo Switch™ in Q1 2019. We should have a firm date for the Steam launch in the next month or so, but you can always join Early Access if you want to save 10% on our launch price and take a peek at what we’ve got so far. You’ll never guess what I’m working on today… but if you guessed I’m taking another pass on the stadium artwork, +1 cookie for you. I think this is like my fourth iteration. My goal is to liven things up, make it feel a little sportier, and make the “jumbotron” area a bit more impressive. Here’s the progress so far (the pillars and the big screen look pretty wonky when you don’t feed them a state to be in). Bigger differences are coming next. For those of you who’ve wished for a way to play Hex Gambit while waiting for your turns to come back, the Blitz Royale has arrived! This single player survival challenge was devised by Abbacus himself, and consists of 6 battles using one, persistent army. Easy: You’ll get an extra AP every turn, and start each match with a full Captain charge. You’ll benefit from a bonus that helps you recharge your Captain’s Ult faster, and your opponents won’t trigger their Ults as often. Normal: You’ll get the same AP as your opponents, and start each match with an empty Captain’s charge. You’ll also receive a bonus charge to help you fill your Captain’s Ult faster. Hard: Your enemy gets an extra AP each turn, and will trigger their Captain’s Ult more frequently. You gain no special charge bonuses for your Captain. Please send your bug reports and feedback for the new mode to contact@onemanleft.com. I’ve updated our Early Access Manual with all the current minion stats and this Blitz Royale info. Our next feature will be an interactive tutorial, so you won’t have to dig through that pdf much longer! The Blitz Royale single player challenge is now available! The totals in the Blitz Royale’s reinforcement screen are off vs. the actual spawn menu. Check back weekly for more progress on our upcoming turn-based strategy game, Hex Gambit. Buy a copy today to save 10% on our $14.99 launch price, then give us some feedback to help shape the final product! If you haven’t already, be sure to sign up for our mailing list to get an email reminder for the official release on PC later this year. Yikes! Almost a month with no blog post. Time definitely flies when you’re focused! On my side of things, not much has been going on visually, hence the lack of posts. I’ve been helping Alex refine the AI logic and plotting out a first balance pass for our single player mode, the Blitz Royale. I’ve also been polishing up some sound effects, which I can’t wait for you guys to hear. Soon the minions will all be yelping and grunting! Alex has a first pass on the AI and cinematic flow done, and he’s working on splitting the mode into Easy, Medium, and Hard now. When we have a good playable pass ready, we’ll be streaming to tell you all about it! Almost done tinkering with this arena background! I’m told Alex has AI working on a basic level today, and my first pass on the single player dialogue is ready to go. Can’t wait to get all this framework in place so we can start battling some bots! With a new rim and a nifty floating gear stage, things are coming along for Hex Gambit’s single player environment. Alex loads out with the new Sniper class, and Adam has the Pacifist in our first asymmetrical Hex Gambit stream. Calm down! The Pacifist is here. 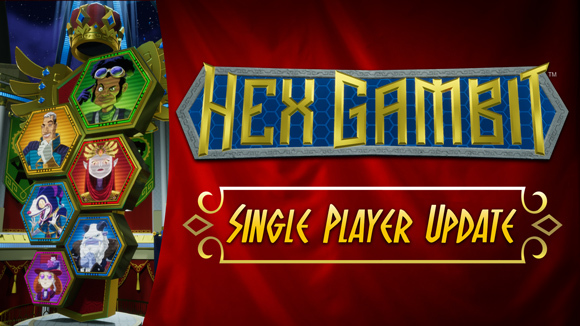 Big day for Hex Gambit Early Access: all seven launch minions are live! With the addition of the Pacifist today, you now have 21 different combinations of minions to use on your team, times six unlockable Captain’s Ultimates to choose from. You can carefully customize your tactics to taste, or go nuts and randomize your loadout every match. Like the Sniper before her, our Pacifist is launching sans sound effects but fully functional. Infectious love and generosity are her specialties! Use her to nullify your threats and to block late game pillar taps. Pacify: Don’t like what’s headed your way? Pacify it to disable tapping and specials for 1 turn. But be warned: this move’s cooldown is a window for revenge. 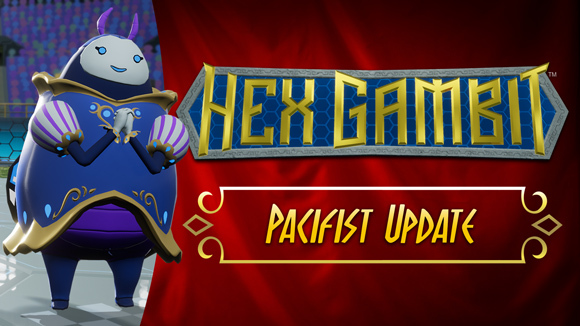 Donate: At 8HP, the Pacifist is Hex Gambit’s most durable unit. Lucky for her teammates, she’s also our most generous! She can give up to 3HP per turn to injured comrades. Pillar Guard (Need 7 VP): Stand next to either friendly pillar to make it untappable. Another big change this update: a better Motivator! Shout is now free with a 1 turn cooldown, and Intimidate now strips buffs from its targets. That means it removes shields and overwrites Inspire. Inspiration will resume once the Intimidate clears, but those shields are gone for good. Enjoy! New Unit: The Pacifist! A master of not fighting. The Sniper’s Tapping Round no longer counts as his pillar tap for the turn. You can do both. Motivator Intimidate buffed: same as before, but now also strips any buffs on the target. Check back weekly for more progress on our upcoming turn-based strategy game, Hex Gambit. Buy a copy today to save 10% on our $14.99 launch price, and give us some feedback to help shape the final product! If you haven’t already, be sure to sign up for our mailing list to get an email reminder for the official release on PC later this year. Slowly developing this Blitz Royale Arena into something neat. The latest additions even provide a hint to our plans for Hex Gambit’s single player mode. When we shift our focus to single player full time, we’ll tell you all about it! Our attention is sort of whizzing around in all directions at the moment, but I found some more time to dig into the arena for Hex Gambit’s single player mode, the Blitz Royale. Here’s where it stands right now.